Semolina is a very gritty, coarse type of flour, usually made from durum wheat. 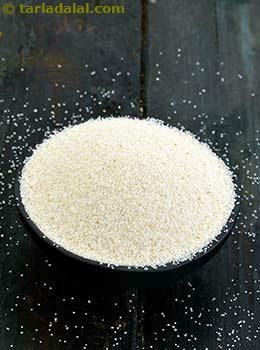 The glycemic index of semolina is 66 which falls under medium GI category. This makes semolina a little debated topic in the area of health. If you have gluten sensitivity, remember you are not supposed to have semolina. This will cause problems such as abdominal pain, bloating, constipation, etc. Is semolina safe for diabetics? Since the glycemic load of raw semolina is 14.7 which is medium GL range it is to be consumed in moderate amounts along with any other low glycemic index food item. 30 grams of raw semolina have negligible amount of fiber. Thus do not have much effect on cholesterol levels. . You can have upma made out of semolina along with lots of vegetables. This will make the upma rich in fiber. However, semolina is processed flour made out of wheat, thus need to be consumed in moderate amounts. Is semolina suitable for weight loss? Healthy Diet and regular physical activity is extremely crucial to remain fit. Anything in excess causes a problem. Since semolina has negligible amounts of fiber, it doesn’t have much effect on satiety and not good for weight loss. Combination of semolina with other food items rich in fiber is advisable in moderate amounts. This allows slow absorption of nutrients in the bloodstream and controls your appetite. Thus when making a choice, prefer something wholesome rather than processed so that it is more effective.